The village of Moneygall lies in the Parish of Dunkerrin. The parish comprises of 67 townlands three of which are detached from the main portion by the intervention of parts of the Parishes of Roscrea and Shinrone. It is part of counties Offaly and Tipperary and covers approximately 24,500 acres. The population of the parish is approx. 1600 people. The land for the most part is a plain, rising in a gentle slope from North to South and culminating in the hill of Crimlin and Rathnavogue with Benduff as their highest point reaching to1399 feet. These hills serve as a watershed dividing the upper reaches of the Nore and Suir rivers which flow south east, from the sources of the little Brosna and the Ballyfinboy which follow a North-Westerly course to Lough Derg and the Shannon. The underlying rock in the plain is carboniferous limestone and the numerous round backed hills or Drumlins yield rich deposits of sand and gravel used in building and road making. Approaching the hills the limestone merges into old red sandstone which contains light veins of copper and iron. The land is mainly fertile and the farming is a mixture of Dairying and the raising of dry stock and sheep, with a decreasing areage of tillage. Many boglands, which gave good fuel for centuries, have been exhausted and reclaimed as farmland or planted forests. In the bogs that remain turf is cut by modern machinery methods. Moneygall, Dunkerrin and Barna have many wonderful heritage sites which are waiting to be explored. These sites have significance to our area but also have a place in our hearts. 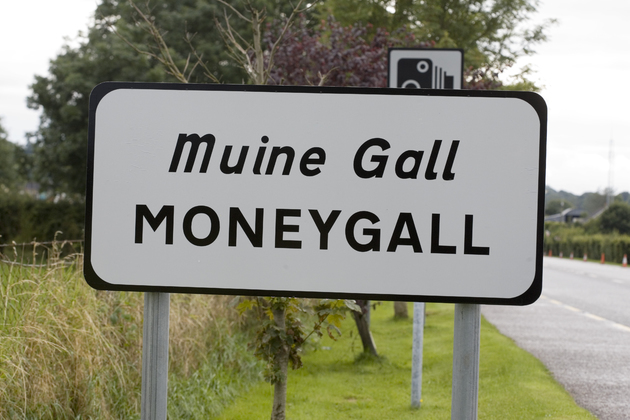 The name Moneygall (Muine Gall in Irish) means “The Shrubbery of the foreigners”. History tells us that as the Norsemen were retreating from the battle of Roscrea in 942, they were overtaken and killed in this area. It is believed that human remains unearthed near Monegall in the 19TH century are the remains of some of these Norsemen. The sweetest vale in Ireland fair is beauteous Moneygall. With its primrose dell and sweet bluebell in beauteous Moneygall. And down through Derrycallaghan where the lovely lambkins feed. From that mountain rare to the valley fair in beauteous Moneygall. Could I clasp her in my arms again in beauteous Moneygall. And I’ll ne’er forget the Bluestone Blue and the Bridge of Moneygall.